Dirty runoff sweeps urban streets, pollutes groundwater and pressures sewage systems. A University of Copenhagen researcher has invented a treatment method that is now being used at a large, new wastewater facility in Copenhagen, Denmark. At the facility, stormwater runoff is turned into a clean resource without the use of power or chemicals. It is the first wastewater treatment facility of its kind. The large facility in Ørestad, Copenhagen, uses new green technology to clean up to 110 liters of urban stormwater runoff per second. The facility has been established by HOFOR (Greater Copenhagen Utility) and CPH City & Port Development, while the purification technique is the brainchild of University of Copenhagen Professor Marina Bergen Jensen. After a number of trials in smaller installations, Professor Bergen Jensen's method has been put to use on a large scale, in partnership with Rambøll, Watercare and HOFOR. The facility processes urban stormwater runoff from Ørestad which is subsequently clean enough to be released directly into Amager Nature Park. "We have invented a green technology inspired by the way substances are transported through layers of soil in Denmark. The double porosity filter we have developed cleans stormwater runoff entirely without power or chemicals," explains its inventor, Professor Bergen Jensen. Urban runoff is diverted through pipes to the treatment facility, where leaves, plastic caps, bags and other large particles are captured. From there, the water flows into a sandwich-filter system where the double porosity filtering takes place. Using gravity, the runoff flows through the wastewater facility, where very small particles and other pollutants are captured. The water has been cleaned. Finally, the treated water is released into Amager Nature Park. The new stormwater runoff treatment facility is a major win for nature and climate. Among other things, urban runoff is polluted by microplastics, heavy metals and nutrients. It can contaminate lakes, waterways and groundwater if allowed to flow directly into the natural environment. Furthermore, urban runoff requires energy if it is to be pumped to a sewage treatment plant. To solve this problem, HOFOR created the first high caliber stormwater runoff treatment facility. "We are able to reduce the amount of rainwater that flows into our sewer systems, which relieves pressure on sewers during heavy rains." CPH City & Port Development is responsible for developing Ørestad, along with other urban areas across Copenhagen. They are one of the partners in the stormwater runoff treatment facility. "Engineers and developers from around the world are being challenged to make climate renovations in cities in preparation for the type of increased rainfall that we have experienced in recent years. 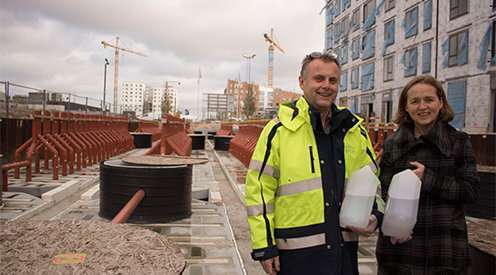 Since the beginning of our development in Ørestad, we have succeeded in locally managing rainwater that falls onto "clean" surfaces like rooftops or bicycle paths. Now, the dirty runoff from Ørestad can be cleaned locally as. It is a major gain for climate preparedness," says Anne Skovbro, CEO of CPH City & Port Development. Cleaned water from the underground facility, which is located beneath Asger Jorn's Allé, will also be planned in as a recreational element as it is released into Amager Nature Park. While stormwater runoff has never been dealt with this extensively in Denmark, an increasing amount of rainfall necessitates the retention of water locally more than ever, and in such a sway that runoff is clean before entering the aquatic environment. According to Professor Berger Jensen, "As a society, we have become increasingly aware of the need to protect aquatic environments, but environmental authorities have lacked the means of controlling urban discharge. I hope this solution paves the way for climate resilient cities equipped with a high level of environmental protection, both across Denmark and abroad." Marina Bergen Jensen is currently focusing on further applications for this technology. After being treated by the double porosity filter, water quality if so good that runoff can be used for toilets, car washes and similar purposes. Watercare, a company based on the Danish island of Funen, produces and markets the filter. The idea behind the double porosity treatment method is inspired by Danish nature. The treatment mimics processes found in Danish soil. The stormwater treatment facility is the largest of its kind dedicated to urban runoff. The facility is able to clean 110 litres of water per second—in other words, more than a person uses every 24 hours. The facility measures 51 m x 13.5 m. No power or chemicals are used by the facility and it operates without any odor or noise pollution. The stormwater treatment facility removes tyre wear (microplastic), dust, brake pad surfacing, soot particles, oil, heavy metals and phosphorus (nutrient), which is often the culprit for cloudy water.